Calvin Anderson of Navarro College will head to Monroe, LA next season and gear up for the Warhawks of Louisiana-Monroe. The 6'4" wing was recruited by New Hampshire, Texas A&M Corpus Christi, Jacksonville, New Orleans, Sam Houston State, Cornell. Lipscomb, Nicholls State, and South Carolina State. When he narrowed his options, the Warhawks came out on top for a number of reasons. "The biggest thing for me was the academic aspect of the school. I'm a pretty good student and I understand that someday I won't be able to play basketball anymore so getting an education that would set me up for life was pretty big and I felt they provided that for me. Also, the opportunity to make an immediate impact. As a junior college transfer, you only have two years of eligibility so I had to make sure I chose somewhere I could make an immediate impact and where I would fit in with their style of play and the culture they've created. I felt good about [those aspects] of things." Anderson was born and raised in Freeport, Bahamas. Prior to his junior season of high school, he was spotted by Casey Autenrieth of St. Louis Christian at the Darrell Sears Showcase. The showcase gives an opportunity for Bahamian talent to play in front of high school and college coaches. Buddy Hield, Tum Tum Nairn, and a handful of other players have participated in the annual event. Autenrieth convinced Anderson and his parents that the best move for his burgeoning basketball career was to come to the States. Anderson agreed. He would finish out his high school career 1,700 miles away from his hometown. He suited up along side fellow Bahamians Nate Bethel and Anthony Pratt at St. Louis Christian in Missouri, where the three teammates were all members of the 2015 class. Both Bethel and Pratt had been recruited to SLC the year prior to Anderson's arrival. Anderson knew Bethel from the Bahamas, but he only knew Pratt through Bethel. By the time they graduated, all three had become close friends. At the conclusion of their senior season, Anderson and Bethel committed to Navarro College, a junior college in Corsicana, TX. Pratt accepted a scholarship from Eastern Kentucky, where he appeared in 26 games for the Colonels. He opted to transfer to Midland College, another Texas junior college, for the '16-'17 season. 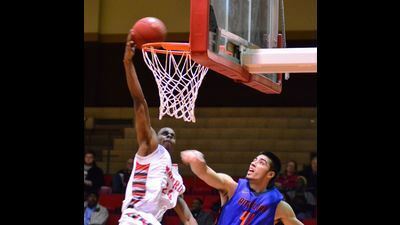 Bethel transferred from Navarro to Highland CC in Illinois. A few factors came into play in Anderson's decision to go to the Lone Star state. "The education system is different [in the Bahamas] so unless you come to America early it's pretty hard to clear and honestly I wasn't physically and mentally ready. So everything played itself out the way it should've through God. I got an opportunity to increase my recruitment and put on 20 pounds while improving my skill level and basketball IQ, so it was the best move out of high school." Anderson had a solid freshman year for Navarro. He averaged 7.0ppg for the Bulldogs, including a high of 23 points in a win over Lone Star-Cy Fair (1/3/16). Navarro assistant Dejan Pavlovic and the rest of the staff looks for Anderson to improve on his freshman campaign. "Calvin is a great kid, very coachable, good grades and personality. He is very book smart and he translates that knowledge to the floor. He is a smart IQ'd kid who knows how to play the game. He is a very good shooter, can put it on the floor and pull up for the shot, even can attack the rim when closed out off the line. Very athletic sharp shooter. [Head coach Michael Landers] will play him at the two guard spot this year. We are expecting him to average 12 points plus per game us and to lead us in shooting percentage from the wing position and be one of the best shooters in the region this year." Anderson has high hopes himself for the upcoming season. "My strengths are my athleticism, running lanes, playing in transition and my ability to shoot the ball and make shots. The intangible stuff like being a great teammate. Knowing when to lead and when to follow. I need to improve my ball handling and defense. I feel like you can never be too good at those things and grabbing more rebounds. I'm underachieving as a rebounder for my athleticism. [Also improving on] being more efficient and consistent with my decision making. Being stronger wouldn't hurt either." The Bulldogs finished with a 14-16 record last season in Region XIV. Anderson is the second Navarro player this season to commit to a D1 school, joining D'Angelo Hunter. Louisiana-Monroe, led by 7th year head coach Keith Richard, went 20-14 (15-5) last season and appeared in the CIT. They currently have two Bahamas natives on their roster, senior Prince Cooper and sophomore Travis Munnings, both of whom played at the Darrell Sears showcase. They also have five junior college players on their roster, and another JUCO recruit, Donovan Walker of Iowa Western CC, currently committed. Warhawks fans will be happy to have Anderson on their squad. "[Warhawk fans are getting] a guy that loves to compete, loves to win," said Anderson. "A player who is going to be the best he can be and bring some excitement from playing above the rim and knocking down shots. But most importantly a leader and a humble player/teammate doing whatever is needed of him and for his team."